Yes, Virginia, there is a Santa and sometimes he comes disguised as a State Supreme Court Judge. Duke will be home for the holidays. The Pit Bull spent the last 4 Christmases in court-ordered solitary awaiting a death sentence for a crime supporters say he did not commit. Thanks to a Brooklyn Appellate Court decision, Duke is now free to return to his family. Forget champagne. 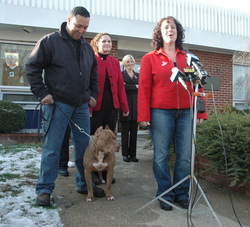 I brought filet mignon to Duke's release from Islip Shelter for a victory celebration long overdue. 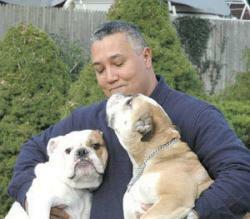 The dog's saga began in 2003 when a Hauppauge neighbor accused Duke of attacking his Bulldog and chasing his horse. His owner, Denise Menendez, maintains Duke's innocence. She says her 2 Pits were at home, calling it a case of mistaken identity. (My Beacon "Pets" 4/18/07 archived online details Duke's judicial journey.) Duke, now 6, will live under "house arrest" since his reprieve was based on the fact that a dog-on-dog attack was not part of the NYS dangerous dog law at the time of the "alleged" incidents. Although he's not exonerated, all who know Duke are thankful for the verdict. Rather than rehash the dispute, it's time to focus on lessons derived from Duke's debacle. First the dog himself proved to be remarkable. He spent two thirds of his life in the pound, yet kept his cool, never becoming stressed or cage crazed. I saw him in his pen and during family visitations. He'd ignore dogs that passed and would greet all visitors with a wag. The press dubbed him- "Duke the Death Row Dog" but his breed's stigma, the undeserved Pit prejudice sullied his chances. Despite his sound temperament, presumed innocence, and exemplary behavior while incarcerated, Duke's life would never have been spared without the tireless efforts of his advocates and owner. The Islip Shelter staff adored Duke, caring for the big galoot as if he were their own. Former shelter supervisor Matt Caracciolo believed in his peaceful prisoner and took every opportunity to sing his praises despite the Town's official policy of "no comment". Duke's attorney, Amy Chaitoff, well versed in animal law, left no legal stone unturned. Supporters took up Duke's cause with contributions, rallies, websites, and letter writing campaigns. Duke owes a huge debt of gratitude to behaviorist, Jeff Kolbjornsen of Elite Animal Trainers. Jeff has defended high profile dogs before; he has protected others put in perilous situations. Once Jeff evaluated Duke and saw that his temperament was sound- this Pit was unfazed by even the most aggressive dogs- Jeff dedicated himself to winning Duke's pardon. Jeff will also guide Duke and family, if need be, as the canine ex-con re-acclimates to civilian life. Jeff says we must always protect our dogs; understand our legal rights, know our neighbors. That's Duke's legacy. This caveat also encompasses the full spectrum of owner responsibility. We alone orchestrate our dogs' welfare plus the well-being of the people and animals they encounter. It's not enough to profess we love our dogs. We need to protect them via adequate socialization and training, constant supervision ("It's 10 PM, do you know where your dog is? "), secure fencing and ID tags, proper nutrition and veterinary care, and in most casesspay/ neuter. As for Duke, the photogenic Pit grew accustomed to press conferences. He knew the drill. On at least 3 previous occasions, he had been paraded before the media and then back into Islip Shelter. Friday's hoopla, however, was different. Some weird woman was waving a steak. Better yet- he got to take the juicy treat home with him- finally free after 4 years behind bars. That's 28 long ones in dog years. In some respects the many adoptable dogs and cats this week at Babylon Town Shelter (643-9270) Lamar St. W. Babylon are not as fortunate as Duke is now. They do not have a home or family waiting patiently for them to return. Cats do not get any cuter than this 8 week old male Siamese mix kitten in C-9. His eyes are baby blue. He even helped me calm one of the frightened puppies found in the cemetery. Meanwhile "Rodolfo", a young Shepherd mix in Cage 39 was picked up near the Islip border. He's presently an understudy for Santa's team. See more photos on the shelter's Petfinder site. Duke's time is running out - and Jeff Kolbjornsen would give anything to just throw away the hourglass. Kolbjornsen, 46, founder and owner of Elite Animal Trainers in Islip Terrace, recently developed an avocation for saving death-row dogs named Duke. The first, a 1-year-old bulldog from East Meadow who tagged along with two Rottweilers when they mauled a 4-year-old boy in April, was spared. But the other Duke - an amber-eyed pit bull who accosted this reporter with slobbery kisses - is slated to be euthanized Friday. "These two Dukes have a lot of things in common," said Kolbjornsen, who brought the two together for a photograph yesterday. "Both of them have been unjustly accused." Menendez failed to follow the court's order to keep the dogs penned when outside, and a month later, the neighbor, Dominick Motta, alleged the pit bulls attacked his American bulldog. In February 2004, a judge ordered that Duke be euthanized. This July, the appellate division of the State Supreme Court denied Duke's most recent appeal. Kolbjornsen said Menendez hired him a year ago to evaluate Duke. He started with pressing and pulling on the pit bull's ears, feet and flanks. No response, but for tail wags. Kolbjornsen rolled the unneutered male on his back. He picked him up and restrained him. He ran up to his face and stamped his feet. He took away toys, moved his food bowl while he was eating. Nada. Zero. Zip. "I was pushing this dog to see if he would react, but he has the temperament of a Labrador retriever," said Kolbjornsen, who organized a rally last week to publicize Duke's plight and has helped Menendez find new legal representation. "There's no proof that this dog was the one that did it, and everything points to the fact that he didn't." Workers at the shelter mirror Kolbjornsen's assessment, saying the dog's greatest transgression has been to leap atop a table to help himself to a container of Milk-Bones during Menendez's frequent visits. Kolbjornsen, whose calm, steady manner invariably evokes comparisons to "Dog Whisperer" Cesar Millan, said he helps rehabilitate problem dogs for local shelters, and has about 10 dogs available for adoption to the right homes. He added that a request to stay Duke the pit bull's euthanasia order could be filed as early as today. The first Duke already has his fairy-tale ending: The two Rottweilers involved in the child's mauling were euthanized, with the young bulldog headed for a similar fate - until Kolbjornsen volunteered to evaluate him. Kolbjornsen's temperament testing confirmed what many bulldog aficionados already suspected: "Duke's a follower - he doesn't show any signs of being a dominant dog." A compromise to save the dog's life was struck when Kolbjornsen agreed to board and train Duke at his facility until the bow-legged bowser is placed with a new owner who lives out of state and does not have any children. "He's a great dog - I just told him that tonight," Kolbjornsen said of the smushed-faced pup. "I'm going to be sad to see him go." Jeff Kolbjornsen, founder of Elite Animal Trainers, says that the "true dog whisperer is someone who understands and can help your dog achieve freedom to be the dog he was born to be". Whether showing a family how to apply his insight to their pet or defending a dog's behavior before a judge, Jeff, with his sixth sense of canine cognition, is a hero to many the under dog. Jeff specializes in working with problem (or as he prefers- "special needs") dogs and in advocating for dogs wrongly accused, most publicized- the 2 doomed Dukes. He rescued and trained Duke the Bulldog pup who just tagged along when Rottweilers attacked a boy last spring, and is still maneuvering through legal channels to spare the life of Duke, the red Pit bull, a victim in a maze of mistaken identity and judicial snafus. For over 3 years the second Duke has been incarcerated at Islip Shelter by the court under an erroneous dangerous dog law for an "alleged" attack on a neighbor's dog. Adored by the shelter staff, affable Duke aced all Jeff's temperament tests and has weathered his jail time stoically. The Pit just got a stay of execution. Everyone hopes that Duke's latest hearing will send him home soon. Kitchka, declawed catWith keen vision into the subtleties of canine body language, Jeff "reads" dogs like a world class poker player. Take "Gigi" the Westie, for example- the food aggression/ cage guarding tiny tornado terrorized everyone who approached her. "She was bluffing," said Jeff. He could detect the flinch in her eyes and body, and had no problem with her. Now with Gigi's behavior under control, her caretakers are learning how to handle Ms. Smoke n'Mirrors. Jeff, who has earned the title "New York Dog Whisperer", has been studying dogs his whole life. Since 1975 he's researched the behaviors, drives, and social dynamics that make "man's best friend" tick. As a certified animal behaviorist with over 30 years experience in all aspects of dogdom, from Schutzhund to Westminster, Jeff has developed his own "realistic style" of training. His canine graduates perform demos at the LI Pet Expo. 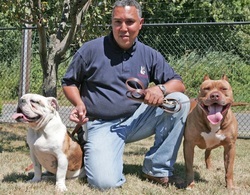 Besides using his expertise to de-program and re-train aggressive and difficult dogs, Jeff has many missions: to educate the public about dog safety and choosing breeds that fit their lifestyle, rather than an image; to encourage breeding only dogs with sound temperaments; to rescue and place shelter dogs; and to convince owners not to give up on their pets. He feels too many dogs are surrendered or euthanized despite "fixable" issues. He urges owners to seek professional help from a qualified behaviorist as soon as problems arise. Think from a dog's perspective: Biting is a natural response. It is the canine way of correcting us. Therefore, basic obedience training may not be enough. Dale, Chihuahua mix.Although Jeff's talents conjure comparisons to TV's Cesar Millan, Kolbjornsen's varied methods are more positive, less pack oriented; plus his NY canine clients can be tougher than laid back California dogs. Jeff teaches to a dog's comfort zone. First he reads the dog to understand what this particular dog needs - in general terms- nutrition, health, exercise; and then specifics drives, socialization, routine, sensory acumen ( is the dog cued by sight, smell or sound ), and the job the dog was bred to do. Medical causes of behavior problems must be ruled out first. De-programming gives a problem pooch an alternative belief system. The process can take from a day to a year, depending on the dog. The longer a dog has gotten away with an unacceptable behavior, the deeper that behavior is entrenched within his psyche. Elite's approach is multi-faceted. Jeff believes in touch therapy and keeping a difficult dog near him. The leash and collar convey energy between the dog and handler. To Jeff there's power in the leash walk that builds bonds and teamwork. Presently he's working with a fearful Canaan Dog who has bitten her family. She is gradually relaxing, stepping closer to Jeff. Her breed from Israel has thousands of years of conflicting history- serving people; banished by them. It takes patience to get a frightened Canaan to trust. More advice from Jeff: "Anticipate everything a dog does and the dog will anticipate what you are going to do". A dog must submit to control before formal training can begin. Jeff says "handlers need to use intelligence, not ego. A good trainer has 3 hands- a soft, medium and hard hand and knows when to use each". The dog need not be wrestled to the ground. At times he employs leash techniques, rocking, a push, or gentle pressure points. Then he tests the dog to see what the dog allows him to do, so he can implement an appropriate plan to phase out the old behavior, and reinforce the new. He trains with kindness and consistency. The dogs respect him, not out of fear, but because he projects an aura of caring leadership. Jeff and the Elite trainers consult for many rescue groups such as Little Shelter, Save-A-Pet, LI Bulldog Rescue, Mixed Breeds in Need, and Last Hope. Elite (631- 277-5278) usually has several rehabilitated foster dogs to place, f u l l y t r a i n e d , with ironclad adoption policies. The Leonards, long time dog lovers, found Jeff when they were about to give up on Cassie, their d y n a m o Hound mix, adopted from North Shore. Susan Leonard agrees that Jeff has an innate rapport with the canine kind. He used behavior mod on Cassie with remarkable results. No treats, merely intermittent, sincere praise. She says his passion for dogs makes the difference. He came through as a lifesaver in a time of crisis -Cassie freaked when she got stuck in a collar. To this day, Cassie wants to please her trainer. She looks at Jeff as if he were her god…. Many dogs gaze at the New York Dog Whisperer that way. Mitchell Stein with his dog, Aurora, who attacked two dogs, he says, after receiving electric shocks from an invisible fence in the yard of Mr. Stein’s Northport home. NORTHPORT, N.Y., Nov. 7 — Don’t be fooled by the quaint veneer of this quiet village on Long Island Sound, warned Mitchell Stein, a local lawyer. Don’t be fooled by the fishing boats bobbing in the shimmering harbor, or the wholesome-looking malt shop, or the good schools, leafy lanes and well-tended homes and lawns. “This place is as un-American as you can get,” Mr. Stein said. His disenchantment with Northport — and with suburban life in general — boils down to one thing: the electric fence, an invisible dog-confinement system that delivers warning signals and shocks through a special collar when a dog approaches a property’s edge. Mr. Stein, who owns a German shepherd, said he installed such a fence last year because of the village’s rules regulating real fences. But instead of simply confining his dog, the electric shocks from the fence may have caused Aurora, Mr. Stein’s German shepherd, to attack two local dogs who had strayed onto the property.Local authorities seized the dog and deemed her dangerous. After a village court hearing this week that stretched past midnight — complete with expert testimony on electric fences and dog behavior, and an ominous shout from a neighbor that “your dog’s going down tonight” — Mr. Stein said he has little choice but to euthanize his pet. Electric fences have grown increasingly popular throughout suburbia, along with dog-attack lawsuits and anti-fence regulations. Some towns, including Munsey Park on Long Island and Asbury Park, N.J., have considered banning the fences in recent years over concerns that they create a false confidence in pet control. To Mr. Stein, the proliferation of electric fences is an Orwellian indicator of the scary state of the American suburb, the crescendo of what he sees as a spreading suburban virus: stifling over-regulation, petty bickering, cliques, favoritism and small-town politics. Mr. Stein, 48, moved into his house on a corner parcel on Ocean Avenue in 1999. He bought Aurora last year for $1,000. Since Northport, a village of 7,600 in Suffolk County, requires corner houses to get special permits for fences so as not to block views, Mr. Stein bought an electric version from Fido’s Fences. But last month, two neighbors complained to village officials that Aurora attacked their dogs as they walked near or on Mr. Stein’s property, leading to a failure-to-leash summons. Dog pound officials and Northport police officers arrived at Mr. Stein’s house on Oct. 27, and met Mr. Stein, still in his pajamas, as he returned from dropping his children at school. He said the police refused to show him the court order to seize Aurora, so he refused to turn over his dog. The police chief said they did hand over the paperwork. Mr. Stein locked Aurora in his car and the police arrested him and took him in handcuffs — and pajamas — to the precinct house in town, where he was held in a holding cell for four hours and spent much of that time meditating in the lotus position. He left with several summonses, including one for having a dog off leash and another for obstructing the seizing of the dog. Officials had a tougher time with Aurora. They removed her shock collar, but had difficulty getting her off the premises. The officials finally removed her and put her in a local dog shelter, no visitors allowed. It was not Mr. Stein’s first problem with a pet. In July, 2004, a resident of nearby Centerport filed a complaint claiming that a previous dog he owned had attacked his dog, a matter that was settled when Mr. Stein agreed to get rid of the dog. With a ponytail and an outspoken manner, Mr. Stein said he has been unpopular with village officials ever since he publicly led a group that successfully opposed the opening of a new bank in town. Mr. Stein said his previous dog died from antifreeze poisoning, and now, with the Aurora story making the local paper, The Northport Observer, “I’m public enemy No. 1,” he said. Mayor George Doll of Northport would not comment except to say that the Northport police enforced the law correctly. Northport’s police chief, Eric Bruckenthal, said the action taken against Mr. Stein was not because of bias, but simply because he broke the law. Mr. Senzer agreed with testimony from the dog behavioral specialist and found that Aurora most likely had been shocked by the electric fence and attacked the neighbors’ dogs to redirect the pain. He said Mr. Stein could reclaim her only if he met a strict list of provisions, including erecting a kennel and fence, hiring a dog behaviorist, and taking out a $100,000 insurance policy covering any future attacks. “Forget it. I might as well put the dog to sleep,” Mr. Stein said as he walked out of the tiny courtroom in Village Hall on Main Street. Interviewed later on Tuesday, he said he had been unable to find an insurance company to sell such a policy, or get village permits for such a fence. At the hearing, Mr. Stein, who said he had argued cases in 26 states and before the New York Court of Appeals, went with the electric-fence defense. He pointed out that there are no sidewalks in front of his house, so passers-by frequently walk their dogs on the edge of his property, which he called “a blatant violation of Constitutional rights of private property.” He said he should not be penalized for what happens to trespassers. Mr. Stein called to the witness stand an employee of Fido’s Fence, who testified that Aurora would never have bolted through the invisible fence, so the other dogs must have crossed the line and aroused her, noting that German shepherds are a territorial breed. Now he wants to move, maybe to New York City or down South.